A collection of links to other sites related to friendship bracelets. 3sistercreations - Custom order Friendship bracelets - Broken link? You can order name bracelets and many of the patterns you see on this site in any color you would like. Abbie - Woven With Love (FB) - Broken link? Alex's Innovations - Broken link? AlicatsCreations-Tumblr Blog (blog) - Broken link? AlysKnackForKnots (Etsy Shop) - Broken link? AlysKnackForKnots (Storenvy) - Broken link? I sell friendship bracelets on storenvy! Andreas world - Broken link? Arismende's Etsy Store ( Etsy shop ) - Broken link? Artesanía Siglo XXI - RAD & DEG (FB) - Broken link? Artesanias Siglo XXI (blog) - Broken link? ArtichokeFox [Etsy Shop] - Broken link? You can visit my Etsy :3 Thanks for visiting! Lots of instructions on how to make friendship bracelets. Arts, Farts, and Crafts (Storenvy) - Broken link? Riviera and Polarpony's bracelet store. We hand make all our bracelets and are more than willing to do custom orders. New bracelets are added regularly. Bracelets By Jen on Storenvy (Storenvy) - Broken link? My Storenvy shop where I sell handmade friendship bracelets. Bracelets d'Helene (French) - Broken link? Bracelets4missions (Gerbilsrawesome's Storenvy) - Broken link? Profits from selling my handmade bracelets will go to help fund my mission trip this summer. Braceletsbyana (lostflight2's Etsy Shop) - Broken link? Looking for fun, funky, handmade bracelets for you or your friends? Well you're in the right place! Can't find exactly what you want? I do custom orders! I can make almost anything you can imagine. BrandisHandmade (Etsy shop) - Broken link? Handcrafted Jewelry & More at an affordable price! A site in English, Polish and German with LOTS of great patterns. BreeGal's Etsy Shop (Etsy shop) - Broken link? Carrie's Etsy Shop - Broken link? Carrie Bea's Accessories, where you can custom order any pattern to be made into a bracelet. Celtic Knot Generator - Broken link? This application can be interesting for generating celtic knot patterns and convert them into an alpha pattern with another program later on. The result can be downloaded as PNG. Enjoy! CoilsbyCady (Etsy Shop) - Broken link? Etsy shop that specializes in handmade friendship bracelets. CraftaholicCarrie (Etsy shop) - Broken link? Charmed_1/C Ann Mc Etsy Shop that sells handmade items. Crafts With Our Own Hands (FB) - Broken link? Crafts made by 1 of three generations of women... Sewing, crocheting, jewelry, needlework, rhinestone embellishments and much, much more! Crafty Tips Arts & Crafts Directory - Broken link? Csomókból Csodát (blog) - Broken link? Friendship bracelets blog in the Hungarian language. Polish site about friendship bracelets with very detailed instructions how to tie many different patterns. Die Knuepfwerkstatt (German) - Broken link? Die Knüpfwerkstatt (FB) - Broken link? DIY beaded bracelet - Broken link? DLTK's Crafts for Kids - Broken link? How to make a basic friendship bracelet. Dorkification (Etsy shop) - Broken link? Neese80's shop, specializing in custom orders and geek related items. Dutchies Bracelets - Broken link? Erich's Place - Broken link? Many patterns and inspiration. Photos of his work. Fantastische Welt der Armbänder - Broken link? German DIY site with lots of tutorials for all kind of bracelets. Create your own bracelet and program calculates length of strings you need! FBCalc program - Broken link? Easily create own bracelet pattern and give you many important informations about it, including string lengths! One of the most popular friendship bracelet site in Russia. Ficusdesigns (Storenvy) - Broken link? Friendship bracelets and beaded pendants. Foz's Rainbowmadness (Etsy shop) - Broken link? Free patterns online - Broken link? This site gives lots of fancy alpha patterns, if you know how to make Alpha bracelets, this will be awesome for you! A collection of friendship bracelets. Free patterns! FriendBird - Friendship Bracelets Exchange - Broken link? A site where one can buy customized friendship bracelets. Friendship Bracelet Ideas by Kallum - Broken link? Pictures of all my bracelets, plus tutorials, vote for your favorite bracelet! Friendship Bracelets - Broken link? A blog with great photos of friendship bracelets and beaded work. Friendship Knots - Broken link? A website with drawn tutorials with easy instructions and different information to help you make awesome friendship bracelets. Fusion Knots by JD - Broken link? This site shows lots different knot patterns for bracelet making. JD uses paracord, but these can definitely be applied to whatever your string preference is. There are YouTube tutorials for every bracelet which are slowed down and very easy to follow. The patterns on this site are fun, and will make a bracelet a LOT faster. Gifts by Sian (Etsy Shop) - Broken link? Janlynn Needlecrafts (Webshop) - Broken link? All materials you need for your friendship bracelets. You can also buy stuff related to needlecraft and beading for example. Jbrans Blog - Broken link? KalisteBracelets (Etsy shop) - Broken link? Karxalc's etsy shop, come take a look, I love doing custom orders! Patterns on pony bead bracelets. Can inspire to make good friendship bracelet patterns also. Keepsmesane1972 (Etsy shop) - Broken link? Friendship Bracelets, knitted scarves and more. Keltyn & Sarah's Emporium (Etsy shop) - Broken link? Kestrels threadbank - Broken link? KleinevosCrafts (Etsy shop) - Broken link? Knot Cool - Broken link? A good site for directions on some basic bracelets including letters, numbers, etc with pictures. KnotALotOfThread (Etsy shop) - Broken link? Welcome to Knot a Lot of Thread (previously Alicat's Creations)! I specialize in handmade, custom bracelets. KnottedWorld (Etsy shop) - Broken link? Here you'll find macrame jewels with a boho hippie style. Everything is handmade with colored knotted cotton strings. Macramè mandala flowers and beads combined to make unique accessories. Knotty and Nice Etsy Store - Broken link? KQ Craft - Broken link? A blog about different kinds of craft. Kumihimo Doro-Mikaeru - Broken link? Facebook Page with kumihimo creations. Leora's ShepsShop522 (Etsy Shop) - Broken link? Little snips (Etsy shop) - Broken link? 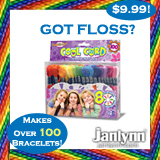 Friendship bracelets, loom band bracelets, beaded jewelry and boxes. LittleWolfYarns (Etsy shop) - Broken link? Little Wolf Yarns brings you hand dyed yarns in beautiful colorways on high quality bases. Live 4 bracelets by Just_knot_itXd (FB) - Broken link? Here you can see all of my projects, my bracelets and my prices! You can always buy by posting a message! Lucky Rat Jewellery - Broken link? LullaBelle Creation (Etsy Shop) - Broken link? I make resin charms! I also do costum orders. Macramè con stile - Broken link? Blog with tutorials macramé to exchange ideas, information and news. Macrame School (Facebook) - Broken link? ManiJJManillas Colombia - Broken link? Marina Ulmer's friendship bracelets.de - Broken link? Order professionally made pattern-instructions from an incredible german woman called Marina. None of her patterns can be found here because of copyright protection. I really recommend you take a look at her patterns! MauChanShop (Etsy shop) - Broken link? Here you can buy friendship bracelets made by me. I also take custom orders. McCrea Bracelets (itsmccrea) - Broken link? itsmccrea This is where I keep track of bracelets that I have created, and plan to sell or maybe even give them away to others. So enjoy my gallery of what I have created. MichelleMadeMoments on Etsy - Broken link? Etsy Shop for top quality friendship bracelets, bookmarks, keychains and other custom orders! MichelleMadeMoments on Facebook - Broken link? Facebook page for top quality friendship bracelets, bookmarks, keychains and other custom orders! Micro Macrame Jewelry - Broken link? My name is Jenny and I am a self taught micro macrame artist . I love to experiment with colors and textures and create unique pieces of micro macrame jewelry. My Frienship Bracelet Maker (MyFBM) official website - Broken link? You can order MyFBM products here and there's some videos/pattern guides. Náramky-Priatelstva (FB) - Broken link? Facebook page about friendship bracelets and everything like that. A Czech site with lots of pictures and stuff related to friendship bracelets. Narukvice prijateljstva (FB) - Broken link? My facebook page with handmade friendship bracelets. Nbeads (Webshop) - Broken link? Jewelry making supplies wholesale, cheap beads and charms. Oasis Strings (Etsy) - Broken link? OMFG Friendship Bracelets (Tumblr) - Broken link? Orlica Craft (Etsy shop) - Broken link? Friendship bracelets and painted glass jewelry. PickSomeColors (Etsy shop) - Broken link? Etsy shop for bracelets by PickSomeColors, aka Tiffany. Promisebracelets (Shop) - Broken link? Pulseras NG (FB) - Broken link? Awesome friendship bracelets all handmade by me! Q'enqo Bracelets (Etsy Shop) - Broken link? Handmade waterproof friendship bracelets. Custom orders are very welcome! Rachel's Bracelets - Broken link? All of these bracelets are handmade by me (Rachel). If you're interested in purchasing one, simply click on the picture you like. It will take you to a page for purchasing. Custom bracelets can be made with any colours, many different patterns, or even words. SarahSuzCreations (Storenvy) - Broken link? Here you can buy bracelets and other fun things 100% handmade! Shamballa Jewels - Broken link? And here the famous Shamballa that everyone fell in love, and I among them. Shannon's Handmade Friendship Bracelets - Broken link? Shedrem Hadmade Crafts - Broken link? Order your DIY kit of any Friendship Bracelet or Beaded bracelet, Yarn and bead or ask me to knit it for you. Shifa's etsy, CrystalStarSpark! (Etsy) - Broken link? Shifa's bracelets can sometimes be found for sale at this etsy. Everything has a little bit of magic in it, maybe there might be one that calls to you~! ShugLok (FB) - Broken link? ShugLok - piggyfan2 (Etsy shop) - Broken link? Great bracelets and other handmade goods for sale! ShugLok | Michelle (Instagram) - Broken link? piggyfan2's instagram account for crafts and bracelets! Sly Raven (Etsy shop) - Broken link? Buy beautiful, creative, and colorful friendship bracelets online! Sukkar Pulsera (FB) - Broken link? Site for my handmade bracelets. Taringueros del macrame - Broken link? Todo lo que necesitás para ser un profesional del macramé! TaylorsMadeIt (Etsy shop) - Broken link? ThatsSoKnottie (Etsy shop) - Broken link? I offer friendship bracelets, beaded jewelry, and custom pieces. I love taking requests too! And everything is handmade by me! The Benign Bracelet (Etsy shop) - Broken link? Please enjoy browsing this selection of colorful, unique handmade friendship bracelets. Custom requests are encouraged! The Candy Striped Lizard (FB) - Broken link? The Candy Striped Lizard (Storenvy) - Broken link? The website I sell my bracelets on. Come and give a like. Throwin' Wristicuffs by TonyMarinara (Etsy Shop) - Broken link? Unique Handmade Paracord and Friendship Bracelets - Custom Orders Welcome!!! Throwin' Wristicuffs by TonyMarinara (Tumblr Blog) - Broken link? Blog featuring pictures of my friendship bracelets, paracord bracelets, and whatever else. Tutorial Paracord Bracelet (2 color Survival Bracelets) - Broken link? How to Make 2 color Survival Bracelets on Homemade gifts made easy. Twilight's Fancy (webshop) - Broken link? Webshop that sells Ribbon crimps, end, clamps etc. UtleyvilleHemp (Youtube) - Broken link? Youtube channel with Hemp knot bracelet tutorials. Victor's Crafts (FB) - Broken link? Wiki-How: Make a Friendship Bracelet - Broken link? Step by step guide how to make the standard friendship bracelet. Wikipedia: Friendship bracelets - Broken link? Here you can read a little about the friendship bracelet technique and definition. With love, from me to you (FB) - Broken link?